Migel Garcia of the University of Maine (70) lines up for a play during the Black Bears' game against Rhode Island. ORONO, Maine — It is 2,359 miles from Uvalde, Texas, to Orono. It is 3,215 miles from Santa Clarita, California, to Orono. Those were the last two places University of Maine junior Migel Garcia called home. Garcia, the left guard on the Black Bears football team, is from Uvalde but spent the past two years at College of the Canyons Community College in Santa Clarita. So while his teammates from the East were struggling with the heat and humidity last summer, Garcia admitted it wasn’t a big deal to him. He is thoroughly enjoying life in Maine, even with the dramatic change in climate from Texas and California. “It has been great. I love the environment. The coaches make me feel like part of the family, and I like the team,” the 6-foot-4, 290-pounder said. Garcia has fit right in with the 5-3 Black Bears, who go into Saturday’s game at Towson (Maryland) in a four-way tie for first place in the Colonial Athletic Association at 4-1. The Tigers also are tied for first. Garcia has started all eight games after winning the job in training camp. He started at left tackle for one game against Yale because of an injury to Gunnar Docos. 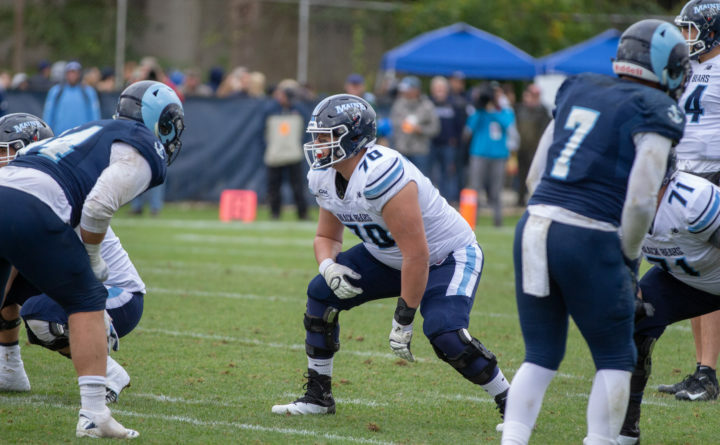 UMaine had to overhaul its offensive line after losing three starters off last year’s team. “He’s a very smart kid. He picked up the playbook fast,” UMaine offensive line coach Pat Denecke said. “He didn’t make a lot of mental errors, which helped him out early. “He put on some good weight. He has a quick punch. He’s very good with his hands when he gets them in the right position. The UMaine line coach said last Saturday’s 28-9 win over Albany was Garcia’s best game so far. “This is a faster pace. Everyone is a Division I athlete,” Garcia said. Garcia, a sociology major with a minor in child development, credited senior right tackle Cody Levy with playing an important role in his improvement. “He taught me some new techniques. He has been great,” Garcia said. Levy said Garcia continues to improve each week and has show he’s strong enough to move opponents up front. “He knows what we’re trying to do every play. He has been a good fit. He has meshed well with the group,” Levy said. Garcia has been an offensive lineman ever since he began playing football in fifth grade. He enjoys the position because of the camaraderie of the linemen. “On the line, we’re five strong. We’re family. They’re great guys. We hang out and do what we do to try and dominate,” Garcia explained. Garcia was on some successful teams in the past, so he knows what it takes to win. His Uvalde High School team went 15-7 in his final two seasons and the College of Canyons Community College went 9-2 last season. He likes the fact the Black Bears are in the thick of the CAA title chase. “We’re trying to be something great,” Garcia said. The son of Ricardo and Maria Garcia knew UMaine was the right place for him when he came on his recruiting visit. He attended College of the Canyons to help him realize his dream of playing Division I football.